Program Development Associates is happy to welcome you to our website: DisabilityTraining.com! 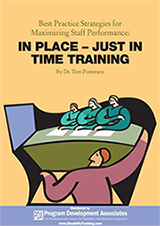 For over 25 years PDA has been providing professionals with resources to meet their disability training needs. We began all those years ago giving seminars on disability and employment. We were being asked to present from coast to coast and by the mid 80's it became obvious we simply could not get to everyone who wanted the training. The conclusion was a much more effective way to provide the disability education we were being asked for would be to begin producing disability videos. 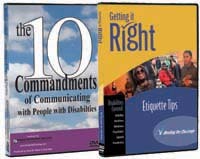 We currently specialize in distributing disability DVDs and training curriculum to assist human service and special education professionals providing services to adults, teens and children. Topics benefiting human service providers working with adults in the community include social skills, sexuality, advocacy, mental health, workplace skills, aging and safety. We offer a wide selection of disability products to teachers in special education who want information on inclusion, behavior, and staff development training. Professionals in Early Child Development find our collection of resources on intellectual, learning, or physical disabilities highly effective for staff training. We provide a cross section of documentaries, curriculum, and training tools on healthcare, autism, communications, technology, job placement, transition and assessment that can be used in either the classrooms or the community making training and education easy and efficient. 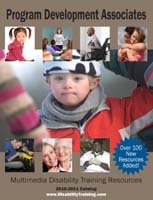 Although disability programs are the primary focus, diversity products that focus on training and education are also important elements to achieve full community participation, Topics like disability awareness, the Americans with Disabilities Act, inclusion, bullying and advocacy go hand in hand with diversity education. Therefore we have expanded our collection to accommodate the needs of organizations, government agencies and businesses that have also come to this realization. Program Development Associates diversity training topics include workplace and customer service and provide documentaries, information and training on age, race, religion, sexual orientation, or gender discrimination. This one stop shop makes it easy and convenient for both human service and human resources professionals who need educational resources on disability or diversity to achieve their training objective. In the beginning we were a small home business with 1 video. We added a second, then a third, and now, 25 years later, we have over 700 resources available. We continually monitor and update our categories and resources to assure we provide the most current and highest quality disability and diversity materials to our customers. On-line previews, user guides and summaries are available on many of our resources for you to take a look at, so you don't have to buy without "kicking the tires" first. For over 25 years our job has been to make your job a little easier. That has always been our primary goal and we continue striving to give our customers the training, education and teaching tools they need. It is our hope to continue to provide schools, colleges, government, business and not-for-profits with the very best resources available for at least another 25! To read more information about Program Development Associates, please check out our Company Background.